A three week blackout of UKTV's channels on Virgin Media has ended. The two companies have settled their bitter dispute over carriage, during which details of their arguments frequently spilled out into the public domain. UKTV's channels are now being restored to Virgin's TV line-up, and duplicated channels, added to Virgin's EPG to fill slots are being removed. As a result of the new carriage agreement, Dave HD and Gold HD channels come to Virgin TV Mix customers for the first time. And more than five times the amount of on-demand programming will be available from UKTV than before the dispute, including what Virgin says are "significantly more boxsets" for Virgin TV Full House customers. 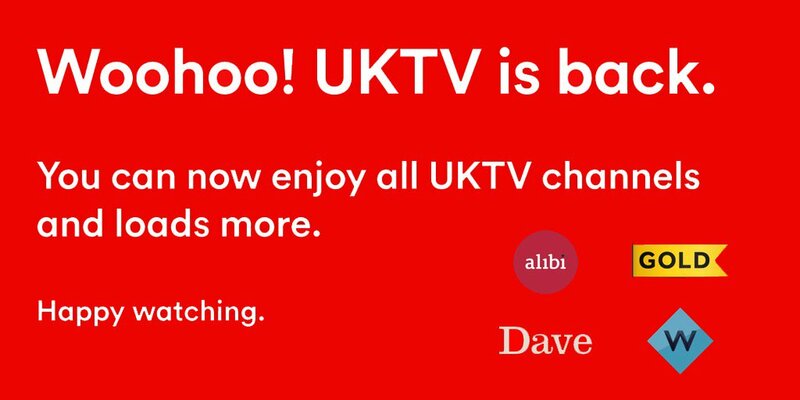 “Reaching this agreement reaffirms our longstanding partnership with UKTV and is fantastic news for our customers. “Viewers are at the heart of UKTV and we want to thank them for all of their support. We know this has created real disruption for some of our viewers and we’re so sorry for this, but we are thrilled to be back, broadcasting our channels and shows to customers of Virgin Media once more." Financial terms of the new, long-term carriage agreement have not been disclosed. At the heart of the dispute was Virgin wanting to pay less money for UKTV's channnels, given that half of them are now Freeview channels, as well as more on-demand content. For Virgin Media viewers, a positive outcome of the dispute has been the arrival of further free-to-air channels on the platform, including FreeSports, Paramount Network (exclusively in HD) and NOW 80s. The addition of these channels coincided with the removal of the UKTV channels, but will remain on the platform following the restoration of UKTV channels. Some cable users have long complained why such channels, despite being available free-to-air everywhere else, were not carried on cable.